Luke Skywalker holds a light saber. Don Lincoln is a senior scientist at the U.S. Department of Energy's Fermilab, the United States' biggest Large Hadron Collider research institution. He also writes about science for the public, including his recent "The Large Hadron Collider: The Extraordinary Story of the Higgs Boson and Other Things That Will Blow Your Mind" (Johns Hopkins University Press, 2014). You can follow him on Facebook. Lincoln contributed this article to Space.com's Expert Voices: Op-Ed & Insights. An elegant weapon ... for a more civilized age. Save 15% on the newest Star Wars gear! Use code: "SW15"
This is the how a lightsaber was introduced to viewers nearly 40 years ago. Trademark weapon of the semi-mystical Jedi, it is said that the glowing blade kept peace for millennia in the Galactic Republic. For those introduced to the weapon in 1977, when the first "Star Wars" movie came out, the characteristic hum of the lightsaber and the epic fight between Darth Vader and Obi-Wan Kenobi is etched in those viewers' minds. If one could explore the device's performance, perhaps a few engineers could turn the lightsaber into next Christmas' hot, new "must-have" gift. At the risk of crushing the dreams of some readers: Remember: "Star Wars" is science fiction. But what do scientists know that could, in theory, reveal how to build a lightsaber? The movies show that lightsabers are glowing blades about 4 feet (1.2 meters) long. They clearly contain a tremendous amount of energy and can quickly melt large amounts of metal. This suggests that these weapons must contain a powerful and compact energy supply. They can cut through flesh without any difficulty, yet their hilts are not so hot as to burn the hand that holds them. Two light sabers will not pass through each other, and there are different colors of scintillating blades. Given the name and appearances, the first obvious thought is that perhaps lightsabers consist of some kind of laser. However, this hypothesis is easy to rule out. Lasers don't have a fixed length, as you can determine using a simple laser pointer. Further, unless the light is somehow scattered, a laser is essentially invisible as it passes through the air. Neither of these characteristics describes a lightsaber. How "Star Wars" weapons work. A more realistic technology is a plasma. Such a material is created by stripping a gas's atoms of their electrons, a process called ionization. This stripping causes the material to glow. A plasma is a fourth state of matter, after the familiar three states of solid, liquid and gas. You have seen examples of plasmas all of your life. The glow of a fluorescent light is a plasma, as are neon lights. Those plasmas seem pretty cool, as one can touch the tubes without singeing any fingers. However, plasmas are typically rather hot, on the order of several thousand degrees. But because the density of the gas in a fluorescent light tube is so low, even though the temperature is high, the total amount of heat energy is very low. An added complexity is that the electrons in the plasma have a much higher energy than the ionized atoms from which the electrons originated. For example, the heat energy in a cup of coffee (which has a much lower temperature) is much higher than the energy stored in a fluorescent light. Some plasmas can actually generate considerable heat. These are called plasma torches. The principle is the same as a lightbulb, but with more electrical current involved. There are many ways to make a plasma torch, but the simplest one employs two electrodes and a flowing material, usually a gas such as oxygen, nitrogen or something similar. A high voltage on the electrodes ionizes the gas, converting it into a plasma. Because a plasma is electrically conductive, it can convey a large electrical current to the target material, heating it up and melting it. While such a device is called a plasma cutter, it is really an electrical arc cutter (or welder), as the plasma actually acts as a conductor to let an electrical current flow through it. Most plasma cutters work best when the material being cut is a conductor, as the material can therefore complete the circuit and send the arc's electrical current back to the cutter device by means of a cable clamped to the target. There are even twin torches, with electricity passing between two torches, allowing the user to cut nonconductive materials. So plasma torches can generate regions of great heat, but the electrical characteristics are problematic, mostly because of the need to have large amounts of electrical current flow and because lightsabers don’t seem to have that characteristic. Are lightsabers simply ultrahot plasma tubes, then? Not necessarily, as a plasma acts somewhat like a hot gas, which expands and cools, just like an ordinary fire (which is often a plasma, albeit an incomplete one, as can be seen by the fact that it glows). So if a plasma is the base technology of a light saber, it needs to be contained. Luckily there is a mechanism for doing this. Plasmas, being composed of charged particles (some with very high velocities), can be manipulated by magnetic fields. In fact, some of the more promising technologies involved with nuclear fusion research use magnetic fields to contain plasmas. The temperatures and total energy contained in fusion plasmas are so high that they would melt their metal containment vessels. So this is promising for lightsabers, too. 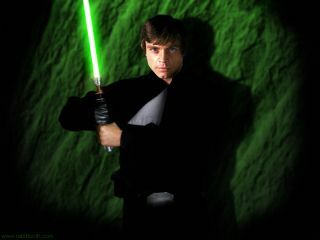 Strong magnetic fields, coupled with a very hot and dense plasma provide a candidate method for creating a lightsaber. However, we're not done. If we had two magnetically contained tubes of plasma, they'd pass right through one another … so no epic lightsaber duels. For that, we need to figure out a way to make a solid core for the sabers. And the material that makes up the core would have to be impervious to the hot temperatures. One possible material would be ceramics, which can be brought to very high temperatures without melting, softening or distorting. But a solid ceramic core doesn't work: When not in use, the hilt of the lightsaber dangles from the belt of a Jedi, and the hilt is maybe 8 or 10 inches (20 to 25 centimeters) long. So the ceramic core would have to spring out of the hilt much in the same way plastic toy lightsabers work. And in "Star Wars: Episode I – The Phantom Menace," Qui-Gon Jinn sticks his lightsaber in a heavy blast door, first making a long cut and then simply melting it. If you watch the sequence, assume the door is steel, and time how long it takes to heat up the door and melt the metal, you can calculate the energy the saber must have. It turns out to be about 20 megawatts (MW). Given an average household power consumption of about 1.4 kilowatts (kW) at all times, the power draw of a lightsaber could run 14,000 average American houses until the battery ran out. However, there is a physical problem. That kind of power means that the plasma would be incredibly hot, and at a distance of only a few inches from the hand of the sword wielder. And heat is irradiated in the form of infrared radiation. The Jedi's hands should be essentially instantly charred. So some sort of force field must keep in the heat. And yet, the blades appear to be using optical wavelengths, so the force field must contain infrared radiation, but let visible light through. Such technical investigations lead inevitably to invocations of unknown technologies. But once you've done that, it is easy to simply say that the lightsaber consists of some kind of concentrated energy stored in a force field. In this way, it could easily resemble how Michael Okuda, technical consultant for the "Star Trek" franchise, explained new technology that could make transporters possible. These were "Heisenberg compensators," he said, supposedly used to correct problems of the Heisenberg uncertainty principle. This is the famous quantum mechanical principle that says that you can't simultaneously know with high precision the location of the position and motion of a particle. Since a person is made of lots of particles (i.e. atoms and their constituents), if you ever tried to scan someone to figure out where all their atoms are, you couldn't accurately measure their location and motion. Thus, when you tried to reconstruct someone, you wouldn't know exactly where to put all the protons, neutrons and electrons. At a deep and fundamental physical level, the Heisenberg uncertainty principle says that transporters are impossible. Of course, this didn't stop the creators of Star Trek. When asked by Time magazine how such devices worked, he said, "Very well, thank you." However, it is equally interesting to see how close current science can get to achieving iconic science-fiction technology. In the case of a lightsaber, the best today's technology could achieve would be a plasma weapon contained by magnetic fields. It would have a ceramic core that utilizes a very dense power source and that employs a force field that blocks infrared, but not visible light. Easy peasy. So, now that I've done the hard part by spec'ing what would be needed, let me now turn to the world's engineers and tell them to get to work. I mean, how hard can it be? Read more from Don Lincoln on his Space.com Expert Voices content page.